Richard Boone, Professor of Ecosystem Ecology in the Department of Biology and Wildlife and the Institute of Arctic Biology at the University of Alaska Fairbanks (UAF), will join Humboldt State University as the next Dean of the College of Natural Resources & Sciences. His appointment begins July 25, 2016. 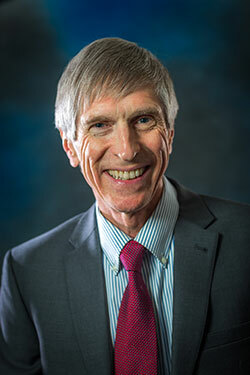 Richard Boone joins HSU as the next Dean of College of Natural Resources & Sciences on July 25. Boone brings a wealth of experience to HSU—he has a strong background in forest ecology, biogeochemistry, trans-national Arctic education, and support for both undergraduate and graduate education. He previously served as Chair of Biology & Wildlife and Associate Dean of Undergraduate Studies in the College of Natural Science and Mathematics at UAF. In addition, Boone was the Acting Deputy Director, Division of Graduate Education (2014-2015); Program Director of the National Science Foundation Research Traineeship Program (2014-2015); and Program Director of the Integrative Graduate Education and Research Traineeship (IGERT) Program (2011-2015) at the National Science Foundation. Boone received his A.B. in Biology from Oberlin College, M.S. in Forest Ecology from Oregon State University, and Ph.D. in Forest Soils from the University of Massachusetts. His research interests include nitrogen cycling, soil respiration, soil organic matter dynamics, global change biology, and science education. Boone has taught courses in Ecology, Global Change Biology, Research Design, and Fundamentals of Biology. He received UAF’S highest teaching honor, the Emil Usibelli Distinguished Teaching Award, in 2010. Boone has served on numerous advisory panels including NSF Ecosystems Studies, NSF GK-12, NSF Geosciences, NASA Carbon Program, NSF Collaborative Research at Undergraduate Institutions, and Department of Agriculture Forest/Range/Crop/Aquatic Ecosystems. He has served as an Alaska Representative to the American Association for the Advancement of Science, past Secretary of the Soil Ecology Section of the Ecological Society of America, and past President of the Alaska Chapter of the American Society for Microbiology. Boone served on the editorial board of the journal “Soil Biology & Biochemistry” from 2003 to 2010. Boone was appointed as an Aldo Leopold Leadership Fellow in 2001 and a National Academies Education Fellow in the Life Sciences in 2007. Boone is passionate about improving STEM education, serving students, engaging with the K-12 community, promoting a global perspective, and fostering the discovery of new knowledge to improve society. Boone also brings a strong commitment to social justice, environmental responsibility, economic health, social well-being, and sustainability to HSU. His advocacy for active learning in the classroom, inquiry-based laboratories, field activities, and student research will be a tremendous asset to the College and HSU.